Through the perilous Darkwood Forest, you the reader must venture in search of the magical Hammer of Stonebridge to save your village! With two dice, a pencil, and an eraser, the reader can assume the role of the hero of the hammer-seeker and play through this adventure. 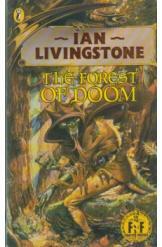 Part of the Fighting Fantasy series.